Travel photography is about more than simply recording what we see and do during our trips. It is more important even than creating art from our experiences while traveling. I believe travel photography also has an important role to play in documenting and communicating to broad audiences the present situation facing underrepresented, repressed, and abused communities, and advocating for change to improve on the present situation. Today’s post illustrates this point. In a series of four portraits made during my recent travels in the north of India, I document several of the serious struggles faced by the girls and women of India–abuse of street children, poverty and lack of education, forced early marriage, and acid attacks–and show how these brave young women are working to empower themselves and others like them to end these abuses. First, we meet a 17-year-old girl from the slums of New Delhi. Let’s call her Sheela (the NGO supporting her work has requested that I not use her real time in order to protect her identity). 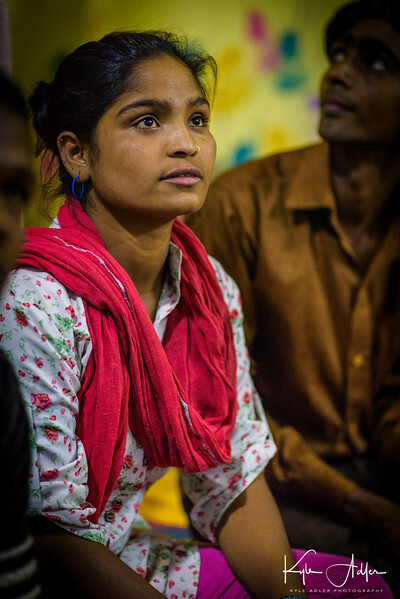 Sheela is the principal organizer of 10,000 street kids from similar slums across the sprawling city. She helped start a newspaper, called Balaknama, to give a voice to the street kids and expose their stories of child labor exploitation, police harassment, and physical abuse. Through her efforts and those of other kids from the streets, the editors who advise them, and the NGO that funds them, Balaknama has helped improve the lives of the poorest and most vulnerable residents of Delhi. My portrait of Sheela is set in Balaknama’s offices and shows her calm and inspiring strength. Lit by available light only, this image was made with a fast prime portrait lens, shot from a low angle so as not to condescend to the subject, and using a wide aperture to soften the background. The feeling this image evokes is one of quiet power and a strong drive to expose and right the wrongs of her society. Next, we meet a girl who was born into poverty in Delhi and was forced at an early age to beg to earn money for her family. Let’s call her Anika. School was not an option for her. 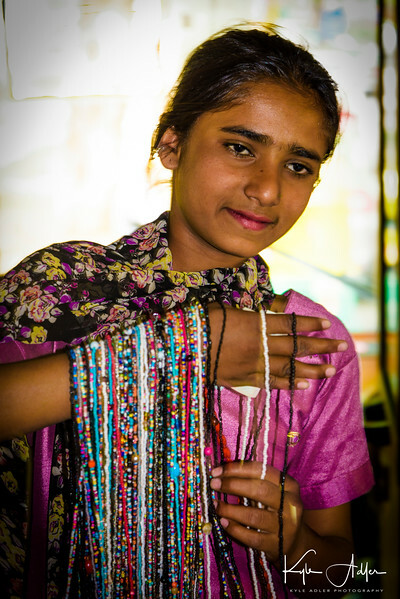 However, Anika found a way to earn more and to avoid begging by selling bead necklaces on the streets of the city. The portrait shows the contrast of her daily life: hopeful yet exhausted, bright yet uneducated, strong yet vulnerable. This portrait was made using natural light with just a touch of fill flash to accentuate the saturated colors of her outfit and her wares. The emphasis was placed on Anika by use of the fill flash, by exposing for her face, and by blowing out the overexposed background. 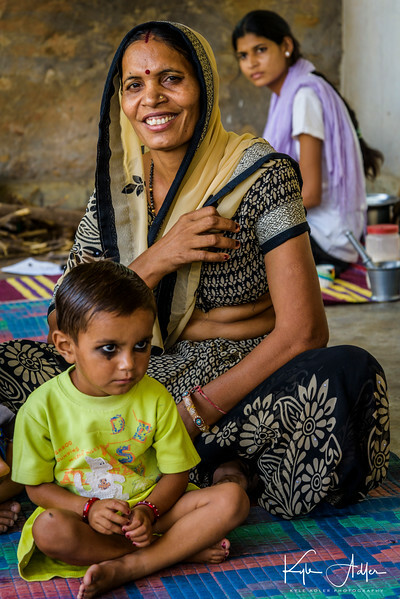 In a small village in rural Rajasthan, we met Parma at her modest house. Forced to marry at the age of 11, Parma had four daughters at an early age. She is fiercely committed to ensuring her daughters receive a good education so that they will have more options than she had. Parma made the brave decision to become one of the first women to join a cooperative formed to allow women of the village to learn to make handicrafts in order to earn money for their families. She and her husband faced considerable scorn from neighbors and relatives over her decision to earn her own income, but now many other village women have seen the success of this program and have also joined. Parma is proud to have learned to sign her name and read a few words, thanks to her older daughters’ having taught her. My portrait shows Parma in her kitchen with her third daughter preparing tea in the background and a neighbor child just in front of her. The image radiates beauty, dignity, strength, and resolve. In this environmental portrait, I wanted to portray Parma in relation to her home, her family, and her community, so I placed her in the center, exposing and focusing on her face, and allowing her daughter to be clearly identifiable yet slightly out of focus. Finally, we meet Rupa at Sheroe’s Cafe in Agra. 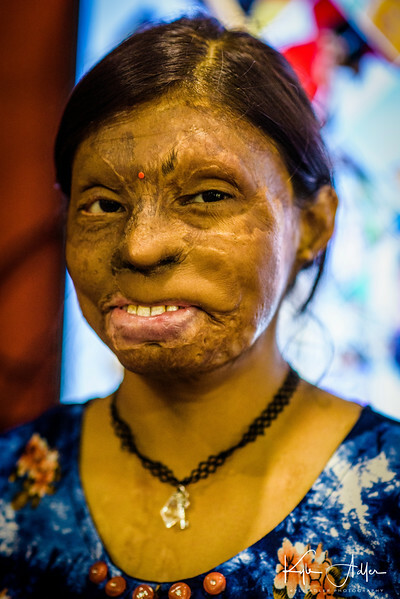 Sheroes’ is a project founded by and for the women of India who are survivors of acid attacks. We were so inspired by meeting Rupa and learning about her story and her road to physical and emotional recovery after her brutal attack at the age of 15 by her stepmother. Through this project, Rupa has gained the confidence and independence to leave home, meet other survivors and activists, build a business as a clothing designer, seek legal justice against her attacker, and access the surgical care required to reconstruct her face. The courage and resilience shown by Rupa and the other women we met at the cafe moved us to want to help their cause to educate people and improve the treatment of India’s women. My portrait of Rupa is powerful because it doesn’t shy away from her scars but allows her courage, resilience, and beauty to shine through. I got in close to Rupa using an 85-mm prime portrait lens and composed a head-and-shoulders image from eye level. I exposed for her face and blouse, which she designed herself, bringing out the vibrant saturated colors. A shallow depth-of-field ensured that Rupa’s face would be emphasized while the background would be soft. I hope this series of portraits of four brave young women in India will inspire you, as their subjects inspired me, to advocate for improving women’s rights in this part of the world. And more broadly, I hope you’ll recognize the power that travel photography has to give voice to the unheard and to fight for social change in the places where we travel. Have you made the opportunity to advocate for change through your images? Please share your story here! Want to read more posts about what to shoot while traveling? Find them all here: Posts on What to Shoot.